Being at the premises of an award winning property that reflects a mixture of traditional and modern architecture, overlooking the island’s coast,“Butterfly Villa” represents the most luxurious, dreamy escape in a Mediterranean setting beyond compare. Located on the cliff edge of the well-known “Butterflies Valley”, it is only a short drive from Paradissi Village and Diagoras Airport of Rhodes and less than 20 minutes drive from the center of Rhodes town. Butterfly Villa” is situated on the top of a magnificent green hill. It is built on 8.000 sq.m land surrounded by beautiful gardens and trees which offer a secluded and peaceful environment, perfect for relaxation and privacy. Butterfly Villa” sleeps up to 12 people with a 360 panoramic view of the Aegean Sea and the Valley of Butterflies. The brand new pool with sunbeds and parasols, the amazing covered sitting area, BBQ and of course the high quality furnitures are some of the features that the guests will enjoy during their memorable stay. A cosy fireplace is located in the sitting room for some unforgettable moments. 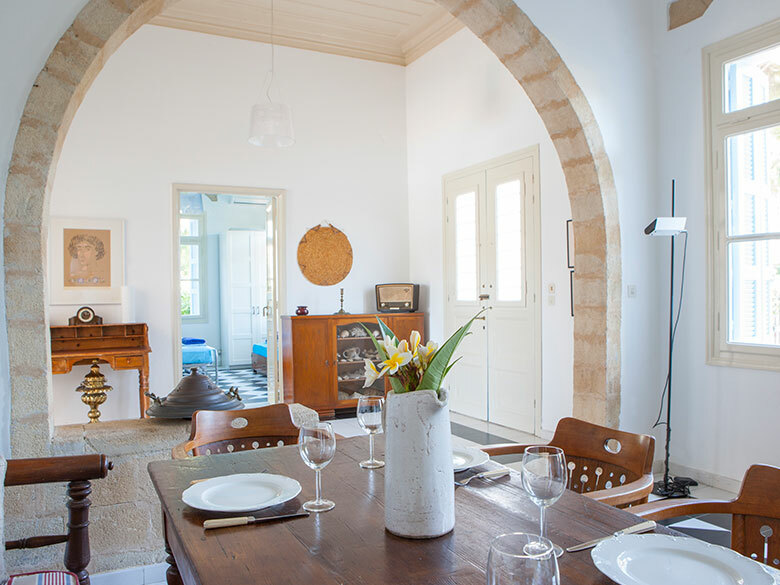 The Villa is land surrounded by stone walls with a remote control gate for the entrance. There is also a high technology security system. A chapel is located in the surroundings of the Villa which is offered for any kind of events and celebrations. Outdoors, there are all the facilities that will make your holidays unforgettable. There is an outdoor swimming pool with sun beds, a patio for barbeque, a covered dinning area as well as a covered parking area. For the younger visitors there is a playground as well as a football and a basketball field. On the ground floor, there is a huge living room with a big LCD TV set and a dining room which overlooks the endless blue sea and the swimming pool. It also has a big kitchen area which is fully equipped with all the necessary electrical devices, 2 bathrooms and a WC. On the same floor there are 2 bedrooms with queen beds and 1 bedroom with 2 single beds, fully air-conditioned. In the master bedroom there is a big LCD TV set. All rooms have access to large balconies with a relaxing sea or mountain view which will make every moment of your summer holidays tranquil. On the first floor, there are 3 bedrooms, 2 of them with queen beds and 1 with 2 single beds, fully air-conditioned as well as 2 bathrooms which one of them has a jacuzzi. In the master bedroom there is a big LCD TV set. There is also a small fully equipped kitchen and a laundry area. On the second floor, there is a small gymnasium with all the necessary equipment for the fitness fans. The villa offers cable TV and free Wi-Fi internet access.